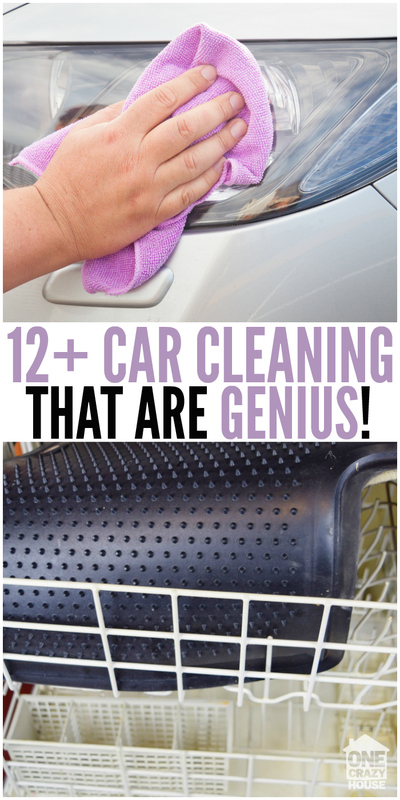 Cars are so hard to keep clean, and not just on the outside! Between the snack crumbs on the floor, the grass and dirt tracked in and the sticky finger prints, keeping a car nice on the inside can feel like a losing battle. 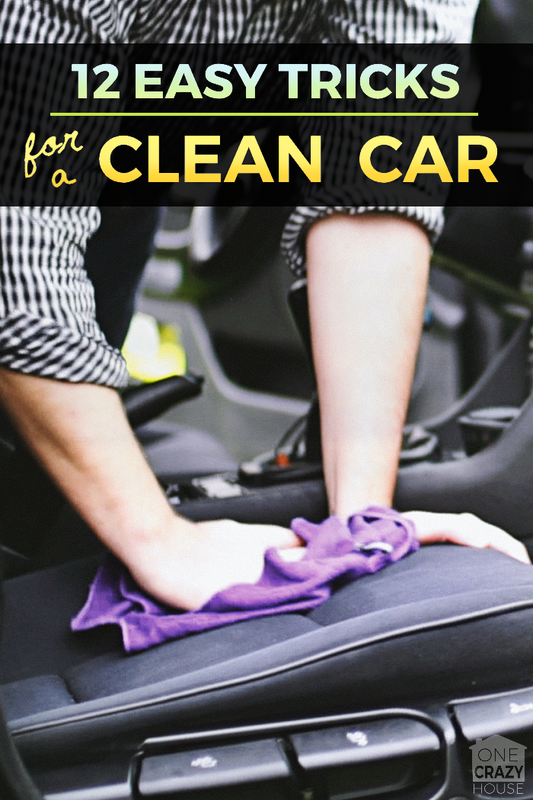 Luckily for you, we love Car Cleaning Ideas and have made a list of our favorite tips. In the past we have shared easy car repairs that anyone can do as well as our winter car tips (cause no one wants to be cold waiting for the car to heat up!). To start with today, we have several tricks and tips that you can try right now to make your vehicle sparkle – with the least amount of effort! We promise. Use Soda to remove corrosion. Soda dissolves rust, making it easier to charge a battery or to remove the rusty spots in a muffler or even in the sidewalls. Just pour the soda on, let it set and bubble for a few minutes and then rinse away. You might need to repeat this a couple of times for stubborn rusty deposits. AND, be sure to rinse very well afterwards so you don’t have sticky residue on your vehicle. Do you like having rain spots on your windows? I don’t. 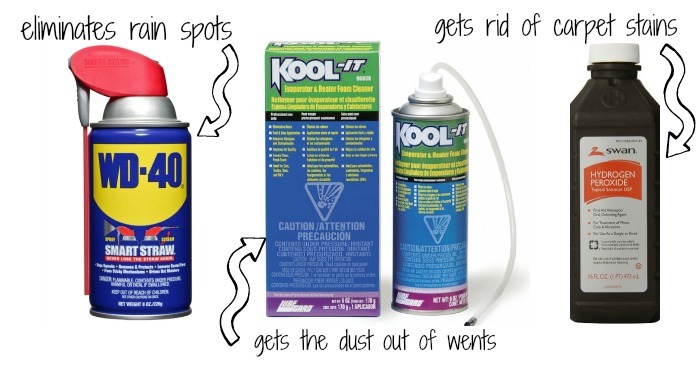 You can eliminate some of the spotting with WD-40 OR hair conditioner. Check and find a conditioner that has lanolin as an ingredient. This combined with silicone (another common hair conditioner ingredient) will provide a protective barrier keeping rain spots from forming on your windows. Did your window washer fluid run out? Make your own washer fluid. Refill it with a mix of vinegar, rubbing alcohol and water. This solution will get your windows sparkly. 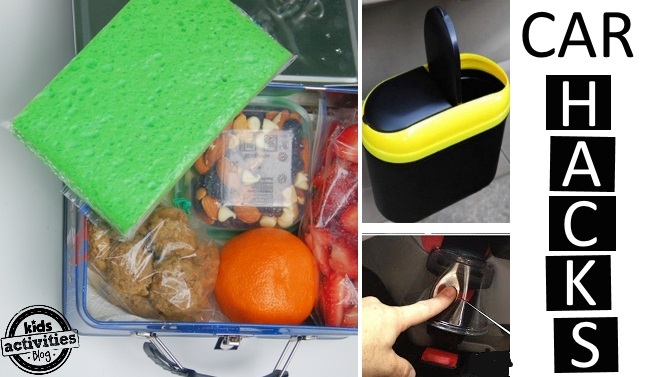 Keep gunk out of your cup holders. You can use silicone cupcake liners as cup holder inserts. Now when you put things into your cupholder to store them you can easily remove the liner and dump the bits out. Must try!! There are a bunch of wacky things that you can wash in your dishwasher. 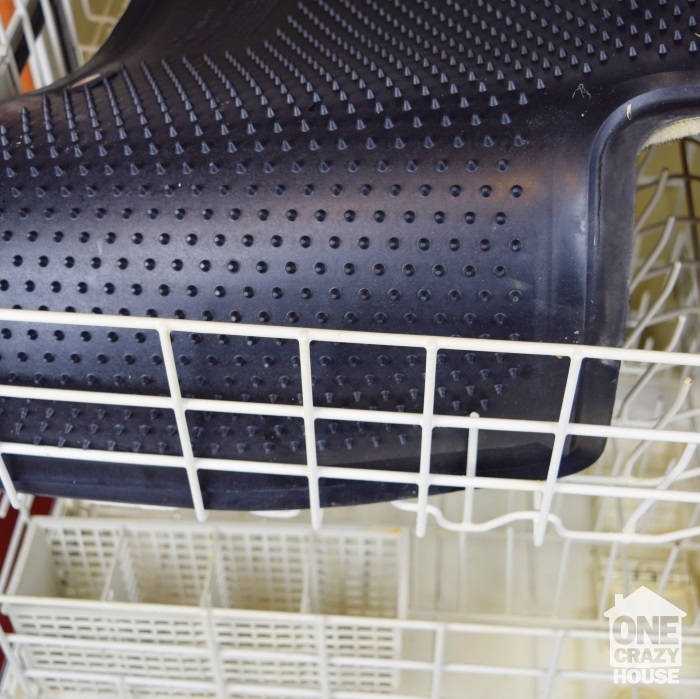 Did you know that you can wash both car mats and wheel hubs in the wash? We didn’t. Be sure to bang out the debris from your mat first. If your car’s air vests are removable, throw those into the dishwasher too! 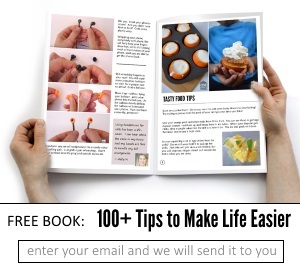 Save you time having to dust between the edges. Do you have black greasy streaks at the bottom of your car’s sidewalls? They can be stubborn to get rid of! Use a paste made from cream of tartar with a drop or two of dish soap. Scrub those on the black marks and they will dissolve. Half the trick to a clean car is an organized car. As you can see in that post, these tricks will help you get your space organized. I love how they use a shoe holder to store items to help organize. If your air vents are not removable, consider getting a can of compressed air and “blasting” the dust out of your vents. Adding a cotton ball with essential oils on it can help draw out the musty smell from within your vents and freshen up your car. Car Cleaning Tip: Are your car carpets a disaster? Check out how this mom used hydrogen peroxide to get rid of her carpet stains. Don’t let a messy car overwhelm you. you can still keep it nice with very little time and effort, and as we all know that equals less stress. Yay for less stressful living!